Here’s a fun idea for our ABCs and 123s letter and number activities series. Join Ellen from Cutting Tiny Bites who is here today with mystery number crayon rubbings. Young children will likely need a lot of practice while they learn their letters and numbers. The more hands on, fun and engaging activities we can provide for them to help, the better! 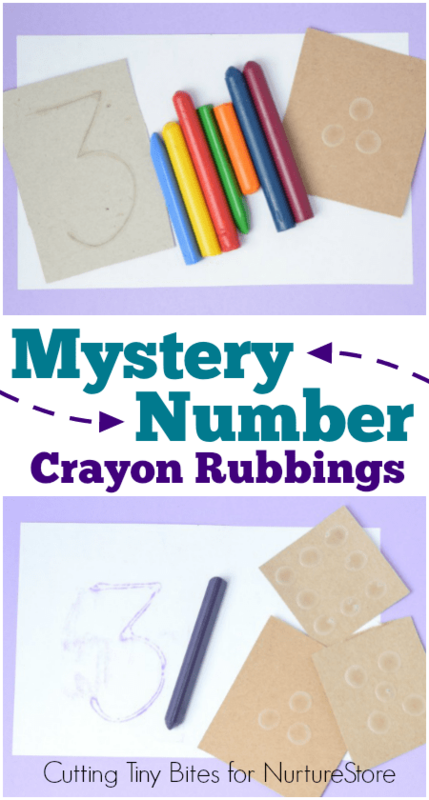 This Mystery Number Crayon Rubbing activity is easy to put together, provides loads of numeracy skill practice, AND has a nice fine motor component as well. Here’s how to set it up! Cut your box board into small squares or rectangles. Draw numerals 1-9 with a thick line of school glue. You can write the numbers first in pencil and then trace them in glue, if you want. 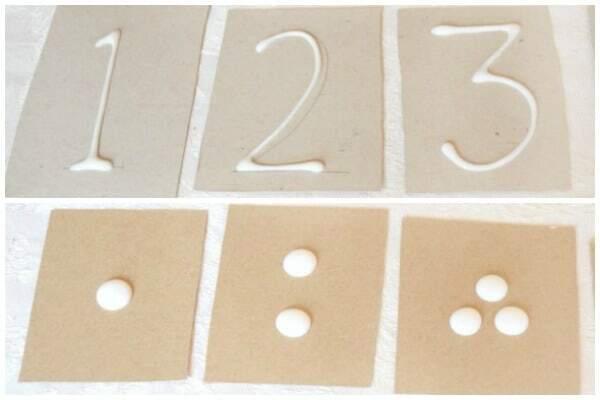 Using another set of box board rectangles, make cards with large dots of glue, one card for each numeral. You may want to copy a set of dominos so that your dots are nice and orderly. You’ll have 18 cards all together. Set the cards aside to dry. The large glue dots may take overnight to dry. 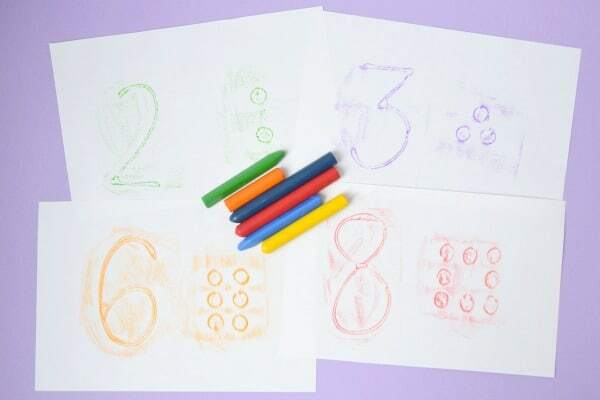 Gather all your dried number and glue dot cards, along with some blank copy paper and crayons. I cut regular copy paper in half to make smaller sheets. Slip a number card under the paper without your child seeing. Have your child rub the edge of a crayon over the number until they can identify which number it is. Once they’ve identified the number correctly, ask them to pick the corresponding glue dot card from the pile. 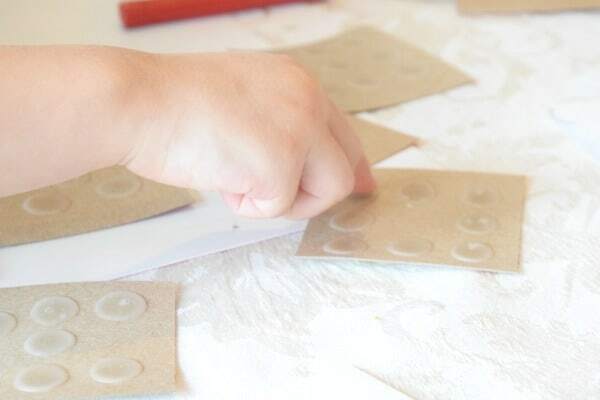 Let your child place the glue dot card under their paper and complete a crayon rubbing in order to make a match. Repeat until you’ve gone through all the numbers! This activity was just perfect for my 3-year-old who is still working on numeral recognition. She could identify some numbers right away, after only part of the number had been revealed through the crayon rubbing. For other numbers, she had to complete the whole rubbing before she recognized it. 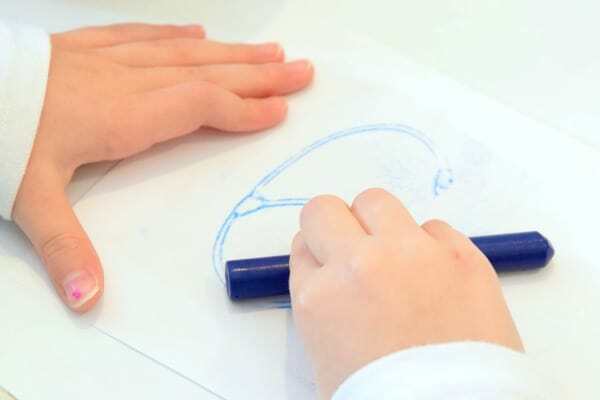 Another benefit of this activity is that your child will get some practice with subitising (immediately recognizing the number of items in a small group without having to count). My daughter could quickly find the lower number glue dot cards, but still had to count the dots on the higher number cards. Even my 5 1/2 year old daughter enjoyed this activity, even though she has known her numerals for ages. She could recognize the numbers that were appearing through the crayon rubbing almost immediately, when only a tiny bit of the number had appeared. I also took the opportunity to help her practice some of her basic addition facts. When she revealed a number “8,” for example, I would take the “8” glue dot card away and ask her to find 2 glue dot cards that would add up to 8 instead. She would take the “5” and the “3” instead, for example. For other fun ideas for teaching math to young children, you may want to check out 10 Ways To Play And Learn With Counting Bears, or this beautiful Numbered Nature Tray. Ellen is a former teacher, turned homeschooling mom to 2 young daughters. She blogs about fun and easy crafts, awesome book lists, healthy snacks, and more at Cutting Tiny Bites. Follow her on Facebook to tag along. I love this activity!! There is so much potential for other great questioning and extending…I think it would be popular in my reception class at this early stage of the year and maybe even with bigger numbers! Thank you for the idea! Hope you class enjoy it, Miss. Allen.